Less than a year since the release of their latest album, the explosive Forgetting the Future, British India are thrilled to announce they’ll be returning to stages around the country in May and June on the Midnight Homie tour that will kick off in Bendigo on Friday 11th May and continue through regional and metropolitan cities in Victoria, New South Wales and Queensland, before finishing up at The Gov in Adelaide in July. 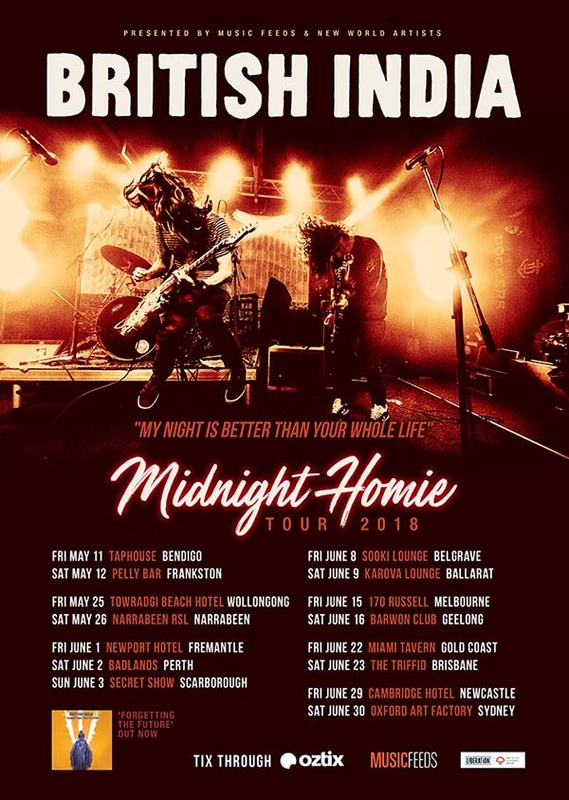 With raging guitars, seriously provocative lyrics and a palpable energy that confidently struts through the track’s entirety, there is little wonder Midnight Homie has quickly become a fan favourite on the album and the live stage. It was twisted alt-rock warlord Lou Reed who once said, “My week beats your year”, but British India have upped those stakes on their new single, touting, “My night is better than your whole life.” Armed with the precision rock stylings of the new record, plus a bulging back catalogue of Australian live favourites - think Hottest 100 dominating tracks like Vanilla, I Can Make You Love Me and Suddenly - Australia’s most loved indie rockers are here to prove the snarling intention behind that arrogant claim.